Save the date and stay tuned: on Thursday 21st February (precise timing to follow as soon as possible), Fleur de Passion will set sail from V&A Waterfront and leave Cape Town towards St-Helena island and Dakar. As « even good things come to an end » as we say in French, this departure will put an end to an amazingly thrilling 2-month stopover during which hundreds of people have had the privilege to discover and for some in particular get inspired by the spirit of The Ocean Mapping Expedition by visiting the boat and Our Spice Islands exhibition. 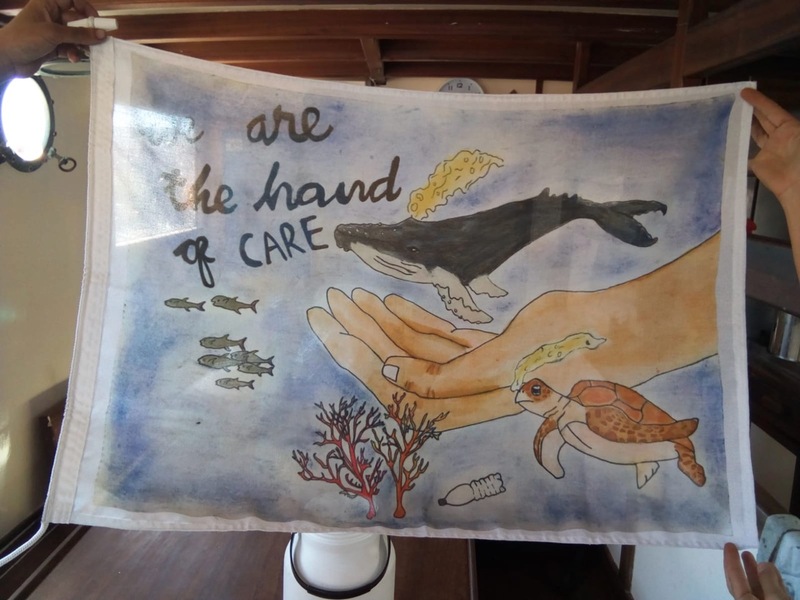 On this occasion, Fleur de Passion will proudly lift up and wave the « flag for the oceans », the drawing that won the 1st prize of the contest organized in January in the frame of the exhibition. The laureate was Ana, a 12-year old Capetownian and with the other laureates, as you may remember, she received her prize from Swiss Federal Councilor (minister) for Foreign Affairs Ignazio Cassis who was terminateing an official visit to South Africa at that time. The drawing has been printed to become a flag that was handed over to the crew last week and is now on board, waiting for the departure. As for the boat, she is currently still in dry dock in front of Cape Grace Hotel for maintenance and will be lifted back to the water just the day before the departure. Why such a tight schedule? Simply because the maintenance work that had to be done on the hull has been delayed due to a technical problem of the synchro-lift. So on 21st February, come and join the ceremony to enjoy one last opportunity to see Fleur de Passion and wish fair winds to the crew and passengers who will spend some five weeks at sea before reaching Senegal by the end of March.